Drew “Moriarty” McWeeny has written an open letter to Mr. Harvey Weinstein (here) in an plea to keep the movie Outlander from being yet another film that gets buried in theaters only to show up on DVD shelves two months later. Drew has seen the film and its of his opinion that Outlander is total geek fun. Now I have been an Aint it cool reader for years now and I trust the reviews of Moriarty and Quint the most, and I’m always surprised at the reactions of talk-backers. Drew is taking major flack for his letter when all he wants to see a good movie make it to enough theaters for us to enjoy. Bottom line, if Moriarty says Outlander is cool, it more than likely is. So now you’re asking yourself, “Greg, why are you covering this on ThePullBox?” Well, because it’s the only soapbox I have, plus we cover all the geeky things we want. I have seen the preview for Outlander and I think it looks like a great popcorn movie. Does it look like the kind of movie you hire a babysitter and take the wife out on a big date to see, no. But it does look like the kind of movie where you ditch the wife, cancel the poker night, and see Vikings and space aliens fight dragons. Or, perhaps the ladies could skip the scrap booking and cheap jewelry parties to see Jim Caviezel sweat for 2 hours. What ever the reasons, early reviews say the film is written well and could do well in that Fall movie drought. Remember Pitch Black? 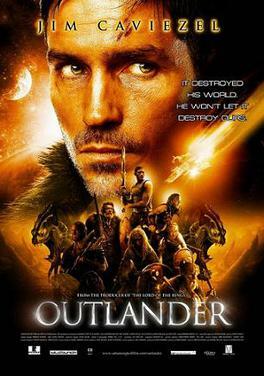 The low budget alien survival film that gave us Riddick was treading the same waters that Outlander is now, and not only is that a great film but was a commercial success as well. So heed the geek call faithful readers of ThePullbox! Check out Outlander when it comes to your area. I know I will.